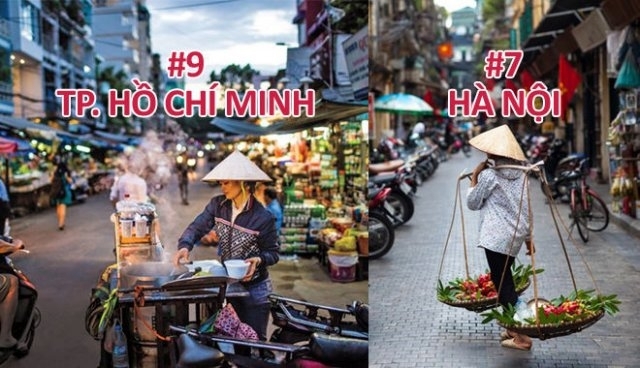 Hanoi was ranked in seventh place and Ho Chi Minh City in ninth place in the Cost of Living Index 2018 conducted by Numero, a global database providing indexes on living standards in major cities around the world. The list is based on the cost of restaurants, house rentals, groceries, and local purchasing power, etc., which were compared to those in New York City, which has 100 points. It was conducted on 27 cities in the region. Hanoi has a lower cost of living than Ho Chi Minh City, with 39.89 points compared to 41.28. The cost of house rentals and groceries in Ho Chi Minh City is also higher than in Hanoi, with 18.81 and 42.17 points compared to 14.56 and 40.28 points, respectively. Purchasing power of local people in Ho Chi Minh City is 36.02 points, also much higher than in Hanoi, with 27.09 points. The only index where Hanoi was higher than in Ho Chi Minh City was restaurant costs, at 22.71 points compared to 20.09 points. Valenzuela in the Philippines is the city with the lowest cost of living in the region, with 31.23 points for cost of living, 3.82 for house rentals, 32.44 for groceries, and 12.95 for restaurant costs. Other cities on the list include Cebu, Quezon City, and Davao in the Philippines, and Surabaya, Medan, Bandung, and Yogyakarta in Indonesia. The five most expensive cities in Southeast Asia are Singapore, Bangkok and Phuket in Thailand, Makati in the Philippines, and Johor Bahru in Malaysia. Vietnam was ranked one of the cheapest destinations by Forbes last year, after the magazine interviewed 14 travel experts who made it their business to keep track of the best bargains around the world to make a list of the most affordable destinations to visit. The country stood out as a low-cost travel destination in South Asia for affordable luxury resorts, healthy food at cheap prices, and beautiful sights.